One word that comes to mind when I think about this game: Amazing. The creative minds behind this game make that so, and bring the kingdom of Amalur to life. You start the game as a random dead body to be disposed of, and are prompted to choose your race, facial features, and name in order to do away with the randomness at this point. After being dropped into a pile of dead bodies you wake up, afraid and bewildered. From there you are prompted to go through the actions of learning the basic combat techniques and explore the reasons why you were dead before and are now alive. You come face to face with your major enemy throughout the game right off the bat: the Tuatha. The Tuatha are Winter Fae lead astray by an evil leader bent on taking over Amalur. The Fae themselves are an immortal race of beings that live in Amalur and share it with the mortal races. They are divided into two seperate groups: The Summer Fae and the Winter Fae. The Tuatha are Winter Fae who have been “misguided” according to the Summer Fae. As you progress through the actions, you are told that you were brought to life by a mechanism called the “Well of Souls”. You are also told that the Tuatha you came across earlier and here for the power of the Well of Souls and you, as you are the only person to have been brought to life by the well of souls. Upon your escape from that area you come across a man known as a “Fateweaver”. He is able to read the fate of any individual and see what they are going to accomplish in life and even when they will die. This fate weaver attempts to read your fate and comes up short. You have no fate that can be seen and can therefore make your own fate, or choose your own destiny. From here, your adventure begins. You can choose to go straight for the next quest in the main storyline, or spend your time doing side quests and tasks for NPCs. The side quests in this game are in abundance and to be honest, are often very fun and well put together. You can also partake in the questlines known as Faction questlines. If you are anything like me you will end up spending most of your time doing side quests and faction quests. I played for a good 20 hours before even beginning the next step in the main story. Basically, this game has over 150+ hours of gameplay and if you are looking for a good RPG to immerse yourself in, you should definately get this one. 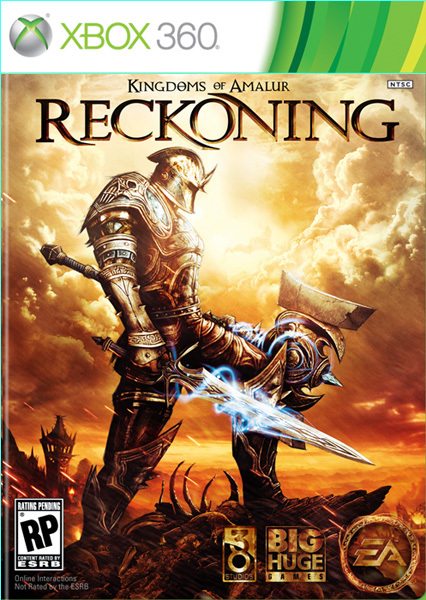 KoA: Reckoning has a somewhat unique feeling to it. You may see hints of Fable and Dragon Age in the gameplay and scenery, but for the most part it is unique. The combat is a point I would like to touch on because I have heard some disparaging remarks that are just not true. So to clear up these rumors, I will say that the combat in this game is really awesome. The variety of weapons is vast from daggers to bows to hammers to scepters. My personal favorites are the chakrams, they are a mage-like weapon with magical abilities as well as the strength to be expected from a sword. Perfect for any mage or battle-mage. Back to combat, the combat may feel a bit repetitive at first, but there is a rank up system with the weapons. As you level up in the game through gaining XP you will get 3 points to spend on either might, sorcery, or finesse. Might is for the warrior types, sorcery is for the mage types, and finesse is for the more sneaky/stealth types. You can add these points into either weapons abilities such as making a weapon style stronger or adding moves to use with certain weapons. You can also chose to add and level up magical abilities, such as a lighting ball to shoot at enemies. All of this together will make combat unique and non-repetitive if you wish for it to be. Another aspect of the game I’d like to lightly delve into is the crafting elements. Much like in other RPG’s you can craft your own armor, potions, and magical items in certain locations in the game. For instance, say you wanted a better cuirass for your character but lack the funds to buy one or you’d just rather make one yourself, you can go find a blacksmithing forge. At the forge, granted your have been leveling up your blacksmithing skill ability, you can craft your own armor and weapons. You can find blacksmithing forges as well as alchemy workbenches (for gem crafting and magic item crafting), and sagecrafting altars (for potions and the like) in almost any town. Throughout the game you will acquire houses for your character, these can also be upgraded to have the forge, workbench, and altars inside them. Another element to forging is gem sockets. Certain armor and weapons you come across or forge will have sockets. These sockets are where you place gems that can be bought or made into the item. The gems can do anything from grant more power to the item, add magical attributes such as fire damage, or even give you health upon using them. There are many different abilities that can be added to your items as well as many abilities that will come standard on certain items. For example, I was able to find a weapon called the “shocking greatsword”. This item is already able to to 105 physical damage, 25 piercing damage, 21 lightning damage, and 10 shocking damage over 8 seconds. All of this together with the weapon itself gives 161 damage in total and enemies stay shocked for 8 seconds after being hit. Another weapon I have is the “Katalepsis” chakrams. These are unique and are thus given a specific name rather than “chakrams of ____”. Unique weapons are harder to come across in the game and are usually special in some way. These specific chakrams do 37 physical damage, 37 lightning damage, 54 shocking damage over 5 seconds, 22 piercing damage, and 25 bleeding damage over 5 seconds. Neither of my weapons have socket slots, but if they did I could add other abilities to them by using gems. Everything you find or make in the game will have unique attributes ranging from a simple +5% melee block efficiency on a shield to something like the chakrams I mentioned above. I could go into more detail about this game, but seeing as it is an RPG and you can play it however you like, I’m just giving you the basics. You can go out there and learn more if you want, or follow what I have done. It’s all up to you. In conclusion I give this game a 9.5 stars for length, the ability to keep my interest, the beauty of the game (graphically and aesthetically in general), gameplay, replay value, and story. This was most definitely one of the best games I have ever played the first game I’ve ever given such a high score to. I would personally recommend this to any RPG fan and I ensure that if you let yourself, you will enjoy this game and definitely get your moneys worth. Do you do reviews of any other games? My friends at MMOAttack http://mmoattack.com are always looking for game reviewers. check them out! I do other reviews yes, I plan on posting them here over time 🙂 And thank you, I will check them out!